It is every caregiver’s responsibility to teach their kids about healthy eating—the earlier the better. But nutrition has so many gray areas and changing rules that it can be very complicated for kids to figure out on their own. Even we as adults get confused. For example, eating pizza once every couple of weeks may be fine but eating it every day is not. Where do you draw the line? Once a week? Every five days? Every nine days? Furthermore, how do you get a four-year-old to draw the line? The Food Talk shows parents how to teach their young (and older) kids about healthy eating in a way they can easily understand. I offer parents concrete, black-and-white rules for their kids about what is “good” and what is “bad” (for example, green is “good” and added sugar is “bad.”) It is an approach that they can grasp right away and carry with them as they grow into adults. While many books on kids’ nutrition advocate masking healthy foods or sneaking vegetables into more “kid-friendly” junk foods, like hiding spinach in sugar-laden brownies, The Food Talk is totally against tricking kids into eating well. Rather, this book shows parents how to educate their children on how to make the best food choices for their own health. It also makes it easy for parents to set the standard for healthy eating for their young ones. 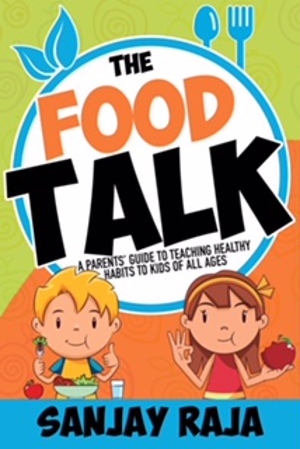 The Food Talk encourages parents to eat with intention and lead by example. We as parents lay down the rules at an early age—as soon as our children start developing their palates. Then as our kids get older, we provide them with more tools and knowledge to make their own informed choices when presented with nutritional gray areas. This 35,000-word book provides actionable steps parents can use to implement changes in their children’s diets at any age. Not only does The Food Talk stand out in the marketplace by providing easy healthy-eating rules that parents can even get their two-year-olds to follow, it is written from the unique perspective of a father with first-hand experience of the high cost of poor nutrition early in life. (That dad also happens to be a former professional MMA fighter and surgical consultant and founder of a worldwide nutrition and fitness education company dedicated to helping children and adults achieve their nutrition and fitness goals through education and cutting through healthy eating misinformation.) I have been having “the food talk” with my twins with great success since they were old enough to feed themselves.